Definition at line 14 of file winsta.h. Definition at line 24 of file winsta.h. Definition at line 19 of file winsta.h. Definition at line 32 of file winsta.h. Referenced by IntAddFormatedData(), IntGetFormatElement(), NtUserCountClipboardFormats(), UserEmptyClipboardData(), and UserEnumClipboardFormats(). Definition at line 18 of file winsta.h. Referenced by BuildDesktopNameList(), IntDesktopObjectParse(), NtUserMessageCall(), and UserInitializeDesktop(). Definition at line 16 of file winsta.h. Definition at line 35 of file winsta.h. Referenced by NtUserSetClipboardViewer(), UserClipboardRelease(), UserCloseClipboard(), UserEmptyClipboard(), and UserSetClipboardData(). Definition at line 36 of file winsta.h. Referenced by NtUserGetClipboardData(), and UserEmptyClipboard(). Definition at line 23 of file winsta.h. 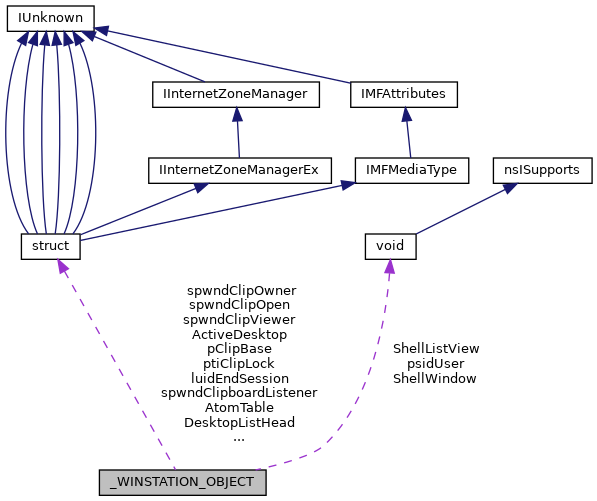 Referenced by IntWinStaObjectDelete(), and UserSetProcessWindowStation(). Definition at line 34 of file winsta.h. Referenced by NtUserGetClipboardSequenceNumber(), UserEmptyClipboard(), and UserSetClipboardData(). Definition at line 33 of file winsta.h. Referenced by UserEmptyClipboard(), and UserSetClipboardData(). Definition at line 39 of file winsta.h. Definition at line 40 of file winsta.h. Referenced by IntResolveDesktop(), and NtUserSetWindowStationUser(). Definition at line 31 of file winsta.h. Referenced by IntAddFormatedData(), IntGetFormatElement(), NtUserGetPriorityClipboardFormat(), UserEmptyClipboardData(), and UserEnumClipboardFormats(). Definition at line 41 of file winsta.h. Definition at line 26 of file winsta.h. Referenced by IntIsClipboardOpenByMe(), UserClipboardFreeWindow(), UserCloseClipboard(), UserOpenClipboard(), and UserSetClipboardData(). Definition at line 27 of file winsta.h. Definition at line 21 of file winsta.h. Referenced by co_IntSetWindowLongPtr(), and NtUserSetShellWindowEx(). Definition at line 20 of file winsta.h. Referenced by co_IntSetWindowLongPtr(), co_UserProcessHotKeys(), NtUserSetShellWindowEx(), and UserGetShellWindow(). Definition at line 38 of file winsta.h. Definition at line 28 of file winsta.h. Referenced by NtUserGetOpenClipboardWindow(), UserClipboardFreeWindow(), UserCloseClipboard(), UserEmptyClipboard(), and UserOpenClipboard(). Definition at line 30 of file winsta.h. Referenced by NtUserGetClipboardData(), NtUserGetClipboardOwner(), UserClipboardFreeWindow(), UserClipboardRelease(), and UserEmptyClipboard(). Definition at line 29 of file winsta.h. Referenced by NtUserChangeClipboardChain(), NtUserGetClipboardViewer(), NtUserSetClipboardViewer(), UserClipboardFreeWindow(), UserClipboardRelease(), and UserCloseClipboard().